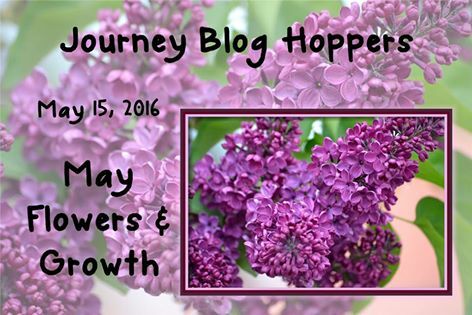 Journey Blog Hop May Flowers – Welcome! Welcome to another Fabulous Fun Stampers Journey Blog Hop! If you arrived here from Sandra’s Blog then you are right on track. If not, just continue hopping along until you come full circle. Today’s card was created as a special encouragement to let someone know they were being thought of during a difficult time. It is important to let others know we care & are there for them. The card base is Lemon Grass with a Banana Cream mat embossed with the Petals Wall Embossing Folder (EF-0007). 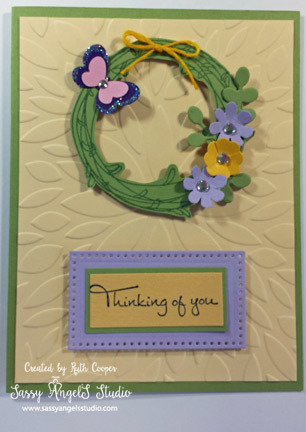 I knew I wanted to do a wreath with the Hello Amazing Stamp Set (SS-0206). I stamped the wreath on Lemon Grass cardstock with Fresh Forest Fusion Ink. I then used my Details Pro Shears (TO-0063) to fussy cut the wreath out. I love these detail scissors, they are sharp & easy to use. I die cut some flowers with the Summer & Tattered Blooms Mini dies (DI-0019 & DI-0020) in Pretty Amethyst & Lemon Drop. The large ball tip on my Bloom Tool (TO-0073) and a mouse pad give the flowers some shape. I added in Rhinestones (AC-0023) for some sparkle. I added leaves with the new Bloom Cluster Die in the Spring Into Summer Mini Catalog (DI-0163). I punched the butterflies out of Bubble Gum & Pretty Pansy with the Flutter By punch cassette & punch handle (TO-0008 & TO-0031). I edged the butterflies with Journey Sparkle Dust (AC-0013). I used Whip Cream Thread (AC-0128) for the bow after using my Lemon Drop ink pad to color the thread. I adhered all the pieces together & used my small Journey Foam Squares (AD-0084) to pop the wreath on the card. The sentiment is from Sentimental Prints (SS-0072). I used the Journey Rectangles Dies (DI-0041) for the mats. The smallest die is in Banana Cream cardstock stamped in Black Licorice. I hand trimmed a slightly larger rectangle mat in Lemon Grass to add more dimension & interest. I then took the next size up in the rectangles with its matching piercing element & cut that rectangle out of Pretty Amethyst to complete the look. I popped the sentiment on with larger Journey Foam Squares (AD-0085). I think this card needs an award for the most Journey products used in one project, LOL! I certainly hope it brings a smile to the recipient when she receives it. Be sure to visit Christine’s blog, the next journey stop on the hop. Beautiful card, I love all the pretty colors! Such a pretty card – and one that can be used for so many occasions. Love your use of the Faith set! I would’ve never thought of doing the cutouts! I love the embossing as well as your color scheme. Really nice job. Love how you shaped the flowers for dimension! Fun colors and great layout!